Stop! Stop! Stop whatever you are doing right this minute and go to Koodos and get a Monica Vinader super big and chunky cocktail ring for 50% off. I kid you not. Go right now. I want the labradorite square one, which is a whopping 2.5cm. 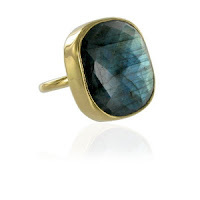 At Net-a-Porter this exact same ring is £160. At Koodos it’s £55. These are the kinds of deals dreams are made of. Go. Why are you still looking at my blog? Go! Shoo! Still here? Okay, then go to Duo and get a pair of made to measure, select your own calf width boots for £20 off the regular price. Use code LY20, and do it by 5 November. Don’t say I never look out for you. love this ring but dont understand the letters attatched to the name when you go to purchase the ring...and all the rings seem to have these letters...what are they? are they ring sizes, if so there is no size chart. Help me, there is only left.